I visit my local Officeworks a few times a week on average. I’ve been known to spend hours in-store and sometimes lose my mind (and all sense of original shopping purpose) in that store. 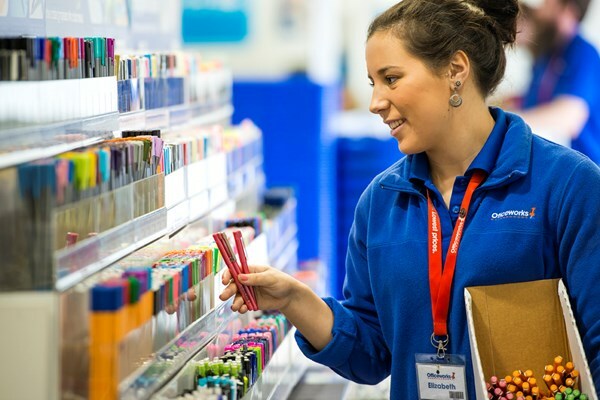 Officeworks is, for a small business owner, the equivalent of Bunnings for a renovator or wanna-be home tradie; Endless aisles of pretty things to distract you, call your name and convince you to buy items you’d not yet identified a need for. In the Officeworks case, it’s enabled me to create a beautiful, Pinterest-worthy home office … ‘yes you DO need red elastic bands, red paper clips, red folders and red thumb tacks to make your home office completely “on-brand”‘ (for the record I’m yet to find asingle purpose for a red rubber band but they look so cute in their own compartment in my desk organiser, which of course is also red). But what I love most about Officeworks is not just their quirky stationery and engaging merchandising strategy, or their great range and competitive pricing. What I love about my frequent trips to Officeworks (and Bunnings) is that there’s a dedicated staff member at the front door to greet me with a friendly smile, every. single. time. It sets the tone for the remainder of the shopping experience. Just like a concierge at a five star hotel, it makes me feel welcome. By engaging with me in the first five seconds of my in-store experience, it makes me feel comfortable to then ask for help, ask questions and seek advice during my time in-store … All things that increase my chances of spending money. How are your customers made to feel in the first few minutes of interacting with your brand? Are you providing a concierge-style experience? This can have a big impact on engagement, time spent in store and eventual spending habits.